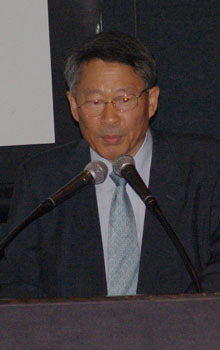 Mr. Kim Kyong-Hae, president of Communications Korea, delivers his speech on PR at the Hyatt Hotel at the invitation of ANZCCK July 12, 2005. Turning crisis into opportunity is what Mr. Kim Kyong-Hae, president of the Korean Institute for Crisis Management and Strategy (KICMS) and CEO of Communications Korea, emphasized in a breakfast forum entitled "The 10 Commandments of Crisis Management and Responding to the Media" held at the Grand Hayatt Hotel in Seoul July 12, 2005. The breakfast seminar was organized by the Australia New Zealand Chamber of Commerce in Korea (ANZCCK). ANZCCK Chairman Les Edwards and scores of other foreign and local businesspeople attended the seminar. In the seminar Mr. Kim Kyong-Hae presented the "Pre-Engaged Crisis Settlement (PECS) System" as the main crisis resolution model for businesspeople in Korea. The presentation started at 8:30 a.m.
As Korea's crisis environment is unique, many local and foreign businesses encounter media and public relations (PR) problems. He particularly identified Korean media as not always being objective and the increasing political influence of non-governmental organizations (NGOs). He believes that media, although not always objective, are being more ethical and fair. Analyzing reporting trend and making journalists interested in the story are important. According to Mr. Kim, this kind of business environment requires prior understanding of Korean media culture. Without prior understanding unfounded rumors could emerge through digital media and intercultural misunderstanding from bad labor management, he said. Mitigation or reduction strategy, using the strategy's 3 Ps — Prepared, Proactive, and Practice — could lessen the crisis' impact. To supplement this are activities for employees and open communication for good employer-employee relations. Maintaining good reputation, in addition to open communication, also applies to media relations. "Effective media relations strategies capture over 80 percent of the overall crisis management strategies," explained Mr. Kim. He cited McNeil's (manufacturer) "Tylenol" poisoning case, which involved the mother company Johnson & Johnson. With a good reputation, J&J was saved from negative reports and publicity. Also through public relations, a tool for tackling media-related issues, we can achieve effective communication. He particularly identified the two flowers of PR, which are crisis management and Marketing PR (MPR). Crisis management deals with problem preparation and solution, while MPR takes care of cost-effective promotion — Marketing through PR. Guiding proper crisis management is the Pre-Engaged Crisis Settlement System or PECS, which was developed by the KICMS, Communications Korea, and Yonsei University's Communication Research Institute. The system specifically focuses on understanding the organization of company through interviews of CEO and staff, briefings, crisis management counseling, and development of each company's crisis management manual. 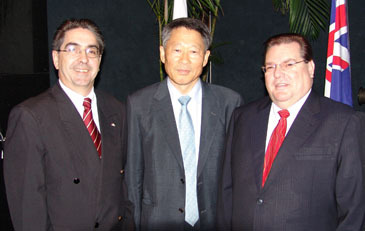 President Kim Kyong-Hae of Communications Korea (center) poses with ANZCCK Chairman Les Edwards (left) and ANZCCK Vice Chairman Glen Feist after his presentation on PR. Mr. Kim recommended regular contacts, information exchange, education/training of a client company at normal times, and inclusion of professional expertise from outside consultants. According to him, these PECS measures can allow people to diagnose and evaluate the causes of crisis and devise a strategy to solve them. To complement the PECS system, Mr. Kim devised the "Ten Commandments for Crisis Management." Included in the commandments is maintaining positive attitude and reputation through sponsoring social contribution activities. In addition, identifying field experts is important but according to Mr. Kim, "should contact them at normal times." He proposed that at times of crisis, it is beneficial to learn the lessons from competitor companies' crises and designating an official corporate spokesperson as media source. Furthermore, companies should execute mock virtual crisis training as effective preparation before crisis comes. Topping the crisis management strategy is strong CEO involvement to show the company's position clearly. Mr. Kim also suggested expert handling of the media especially during crisis because media are against each other for scoops. To prevent media crisis, "provide as much information as possible to the press," he argued. As the first 24 hours during the crisis are important, business people are suggested to make statements immediately. 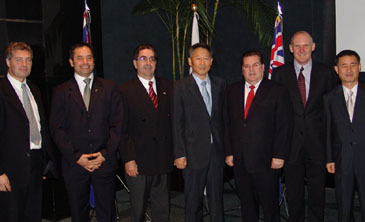 President Kim Kyong-Hae of Communications Korea (center) poses with ANZCCK Chairman Les Edwards (3rd from left), ANZCCK Vice Chairman Glen Feist (3rd from right), and other ANZCCK dignitaries. In addition, humanistic stories can be applied to neutralize the serious straight news. Mr. Kim used as an example the Asiana Airlines' publication of rescue stories during plane crash incident, which helped diverted negative image for the airline. He advised businesspeople not to use business jargons in dealing with the media as jargons can result in misinterpretation. Mr. Kim referred to this strategy as "The Non-expert Expert." By making the explanation using simple terms, the news source can relate facts clearer and understandable. He also reminded news sources of the need to think twice before giving out information to journalists. separately because of the language barrier. They tend to rely mostly on English-language newspapers and press releases are primarily for only local vernacular dailies. "Also don't discriminate against less influential media," he added, as they can work with influential ones to dig up negative information. Delivering message by all means and achieving this through effective public relations are what makes companies thrive in Korea's unique crisis environment. As Mr. Kim Kyong-Hae's Communications Korea believes, "90 percent of crisis factors can be eliminated by preventive measures." 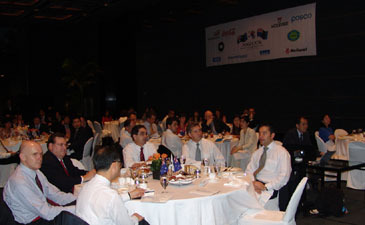 A number of both local and foreign businesspeople listen to the presentation on PR made by Mr. Kim Kyong-Hae, president of Communications Korea, at an ANZCCK's gathering held at the Hyatt Hotel on July 12, 2005. President Kim Kyong-Hae has years of experience in the PR industry and PR crisis management. The Communications Korea was founded in 1987 as the nation's first public relations agency. He is also the key founding member of the Korea Public Relations Association (KPRA). 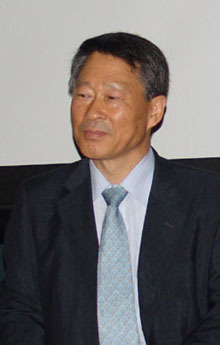 Having obtained his BA degree in English Literature from Sogang University in 1973, he earned his MA degree in the same field at Sogang's Graduate School of Mass Communications in 1999. Since then he has been lecturing PR to the general public as well as its graduate students. Prior to his journey as a PR expert, Mr. Kiim Kyong-Hae worked himself as a journalist for a number of years. His journalistic stints include staff reporter and editor of The Korea Herald, Seoul correspondent of the Reuters. 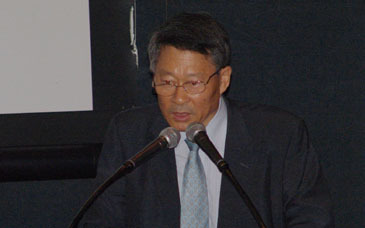 Mr. Kim also founded nation's first and only English-language business monthly, "Business Korea." Mr. Kim has so far authored four books on PR, including "Big Think PR," his most recent book covering theoretical and practical knowledge of PR. Earlier, he published "Companies Overcoming Crises, Corporations Collapsing Due To Crises," which is a collection of case studies of selected companies in 2001. His 1999 book — "Live Stories On The PR Scenes" — deals with crisis management in Korean settings. The following is the full-text of Mr. Kim Kyong-Hae's speech. 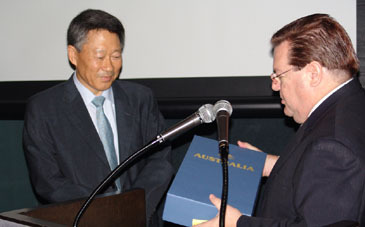 President Kim Kyong-Hae of Communications Korea (left) receives a box of Australian and New Zealand wines from Glen Feist, vice chairman of ANZCCK in appreciation of his speech. Regarding effective responses to the media at times of crisis, experts in foreign countries have been presenting diverse methods. However, for foreign corporations that have entered into Korea, it is important for them to understand the techniques of Korean-style responses to the media which have taken into account the special Korean-style media environment. From my experiences, I believe that at times of crisis effective media relations strategies capture over 80 percent of the overall crisis management strategies. As citizens find out about crisis situations and the crisis management processes of corporations at times of crisis, it is necessary to show the initiative to "control" the media instead of "being controlled" by the media. Below, I shall give a detailed explanation of the ten commandments for responding to the media when crises have occurred that have been developed by the Korean Institute of Crisis Management and Strategy (KICMS) which I manage. Until now, it has been erroneously recognized that in a crisis situation hiding information from the media instead of providing information to the media is the secret of crisis management PR. As they cannot write their articles and have their newspapers published with blank spaces just because information is not provided, reporters end up writing their articles by relying on groundless rumors, interviews with competitor companies or other third persons, etc. Hence, the situation can be worsened instead. There is a principle of crisis management that ‘For the articles regarding your company, make the spokesperson of your company the single authoritative source of information on the crisis issue.' The condition of information vacuum brings about scary consequences. When providing information to the media, if there is a mistake on the part of the company, boldly admit this and declare the firm determination to approach the resolution of the problem according to public interest. The first 24 hours after the outbreak of a case are the most important. It is not a good idea to make the public wait in order to make a statement of the perfect position of the company. The statement of the company must be announced at least within 24 hours. Especially, if you miss the deadline time of TV stations and/or general dailies, there is the high probability of the concerned media reporting multifarious causal analyses and the pieces of information and/or groundless rumors acquired from competitor companies. Even if a perfect press release is offered after the copy deadline, it becomes useless and makes the crisis management even more difficult. Even in a state in which the precise results of the investigations have not come out, if a statement that explains the present progress of the investigations and includes the basic position that as soon as the investigation results have come out the public will be immediately informed is announced before the copy deadlines of TV stations and/or general dailies, this can not only stop baseless rumors from spreading but also prevent confusion from taking place. This is a matter for the CEO's of companies to be the most careful about. The Korean press is not thorough with quotations like the Western media. Even if an interviewee says something that is grammatically incorrect, the Western media write the speech just the way it was uttered and provide a more accurately interpreted speech in parentheses. Reminded of this, however, one must not think that this is the same here in Korea. It is not the same. This is why managing quotations, in particular managing quotations at times of crisis, is consequential. Readers get to presume that at least the words in quotation marks are statements made by the president of the corporation. This is why if a quotation is made mistakenly in a crisis situation, the image of the corporation gets damaged. And, if the corporation gets thought to be an enterprise which does not have crisis management capabilities the crisis management falls into a state in which it is difficult to be restored to normal any more. In case a fatal false report is found during the process of inspecting the media reports in a crisis situation, a responsible person from the company must pay a visit to the media, explain the facts courteously, and make the request for a correction. Although a correction report may no come out right away, by doing this, it makes it possible for an accurate article to be published later when the reporter in charge writes an article again regarding the same case. In the case of a misreport, it would be a mistake to remain still without taking any countermeasures thinking that the concerned media is a tough media to be dealt with. Recently, with regard to false reports by the media, the Roh, Moo-hyun government has been strongly confronting them so much so that the confrontation is called "a war against the media." And, recently, reporters have been thinking that the demand for rectification with regard to incorrect reports is feasible. These days, with the internationalization and globalization of corporations being emphasized, the influences of the contents of the articles published in the major foreign media overseas on the management activities of the corporations here in Korea cannot but be big, to degrees that are not any less than the influences of the contents of domestic reports on the corporate management activities of the corporations in Korea. Hence, in crisis situations, strategies regarding not only the reporters of the Korean media but also foreign correspondents must be formulated. Especially, as in case the direct provision of a press release is not possible foreign correspondents rely a lot on major general dailies and English-language newspapers, there are many cases in which the position of the concerned company does not get delivered well and accurately. In the case of engaging in indirect news coverage through the general dailies and English-language newspapers here in Korea, there are frequent distortions of the position of the concerned company. Among the staff members in actual charge of PR in each corporation, there must be at least one person who is fully in charge of foreign correspondents. At ordinary times, friendly relationships (Ally-building) with foreign correspondents must be maintained. Especially, there are many cases in which the reporting attitudes of the Korean media are greatly influenced by what kinds of positions the major foreign news have. In particular, this is even more so during crises. If you use too much business jargon regarding a crisis situation in speaking to reporters, who are in a hurry to meet the copy deadlines, the reporters may not be able to understand accurately. And, they may write incorrect articles during the situation of crisis, thereby making it even more difficult to overcome the crisis. Hence, in a crisis situation, you must make your statements in easy language, thereby making it possible for the reporters to write the articles easily and smoothly. This is especially more so as the general readers prefer more the articles that are easy to understand than the articles that have a lot of specialized terminologies. In particular, in crisis situations, fierce news coverage competition pressed for time takes place. Hence, reporters do not have any time for checking the meanings of technical terminologies. If you use a lot of business jargon, there are many cases in which articles that have mistaken details come out. When a crisis has occurred, news reporters must write not only the straight news but also diverse digression articles, including behind-the-scene stories and others of the like. Therefore, if the behind-the-scene stories and other such things that are filled with humanity and that can either mitigate or neutralize the straight news articles are provided, the effect of having the orientations of the articles stray, to some extent, from the core can be obtained. After the crash of an Asiana Airlines passenger plane, the Public Relations Department of Asiana Airlines developed and provided the stories of praiseworthy anecdotes related to the residents' warm human love and their work of rescuing survivors. It explained by putting business jargon into easy language. It carried out PR activities which effectively satisfied the desires of the reporters. As a result, the Public Relations Department received the evaluation that it conducted effective crisis communication activities by alleviating, to some extent, the straight news related to the accident. Of special note is the fact that stories related to humanism are things that can move the minds of the reporters covering a crisis situation and that articles filled with humanity, indeed, soon make the readers and viewers have the positive thought that the concerned company has been engaging in crisis management well. At times of crisis, the matter to be kept in mind by the persons in charge of PR is the fact that field reporters, by their own nature, are chasing after scoops. At ordinary times, intimate human relationships can have been formed between news sources and news reporters. Some persons in charge of PR can have very close relationships with specific reporters. But, when crises have occurred, some executives in charge of PR open their hearts and tell frankly things that should not be told to the reporters with whom they have intimate relations. In most cases, these stories get published as articles and they bring about the outcome of worsening the crisis situations even more. The main concern of reporters is always scoops. When a reporter scoops, he or she is given all kinds of privileges and honors, including a promotion, salary adjustment, move to a hoped-for post, the furnishing of a special bonus as an incentive, prize-awarding from inside and/or outside the media, etc. Also, he or she becomes envied by his or her colleagues. Because of these reasons, the main matter of concern and interest of reporters cannot but be scoops. As a result, in crisis situations, the persons in charge of PR must bear in mind this point. Discriminating against the media that have little influence is a foolish thing. This is so because, if a reporter of a media that does not have much influence concentrates on digging out the private parts of the company involved in a crisis on an emotional level and publishes these in a big article, eventually the article will be seen by a reporter of a media that has much influence and this will lead to a fiasco. Whatever the media, it should be dealt with fairly and impartially. Especially, as the media that do not have much influence know very well that their influence is small, if a news source treats them with discrimination they start handling the news source as an enemy. When a crisis has occurred, experts from each field are always mobilized. There are discussion programs involving them. And, contribution articles by these experts are published in major general dailies. News reporters publish the comments that certain experts view the event so and so. Such speeches by experts have big influences on crisis management. It would be good for the crisis management team to make a list of the experts who can be mobilized in relation to the present crisis, to contact them directly, and to provide important pieces of information. The opinions stated by these experts from objective, third-person points of view have enormous influences on the formation of public opinion. Hence this work is very important. And, if the persons holding high positions in a company share the responsibilities and form, wide-ranging human relations with these third-person sources of news and maintain them at normal times, this will be a big help for crisis management. There is a Korean proverb that "Men are blind in their own causes" (Literal English translation: "Arms bend inwards"). If people enjoy dining together, for example, at ordinary times, they start having friendly thoughts, and the friendly thoughts get followed up by friendly comments. The above photos were taken by Mr. James (Young-Ju) Huh, staff reporter of The Seoul Times.